With both countries on six points, eight goals scored and two conceded, the only thing that separates England and Belgium is their fair play. Because Gareth Southgate’s players have received less cautions, they are currently sitting on top of Group G.
Although this group should not have been overly testing for England, they have still surprised many with the way they have gone about their business. It is clear as day that they have an immense sense of togetherness in the squad, shown in their celebrations when they scored the winning goal against Tunisia in the opening round. What has also been a standout point so far is their ability to easily score goals. Perhaps a burden for players in previous major tournaments, Southgate has enabled a philosophy that permits freedom and expression from his players and that is seen on the pitch with their eight goals - something for football betting fans to keep in mind. For Belgium, their attack looks effervescent as always and through Romelu Lukaku, they have a striker that is being a continual nuisance for the opposition’s defence. The Red Devils have so many different facets to their forward line, which makes them one of the favourites to lift the World Cup. If they can keep an organised defence throughout, they will feel confident against any nation left in the tournament. One aspect to each nation’s performances that has been similar is their free-flowing attacking nature against Tunisia and Panama. 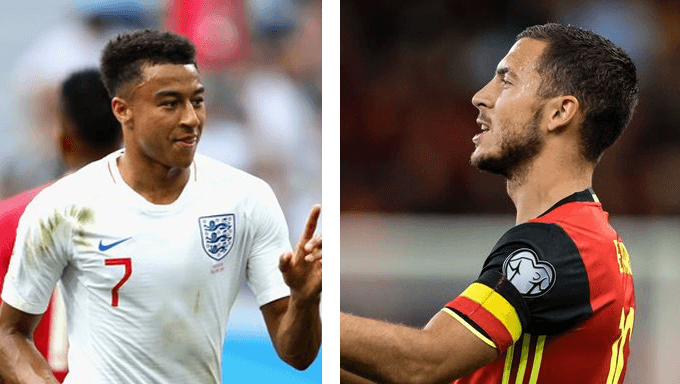 While those countries are of a much lesser quality, both Belgium and England have ripped them apart and created a whirlwind of chances in both of their respective openers. Even though Red Devils boss Roberto Martinez has said he is willing to change 10 players for Thursday evening’s top-of-the-table encounter, there should still be goals involved. Belgium’s depth is perhaps not as strong as England’s, which will fill Southgate with confidence as he looks to win three games from three and head into the last 16. There should be over 3.5 goals scored in this one, which is currently priced at 27/10 with Ladbrokes. With both teams making changes - especially in defence - that is likely to allow each forward line a vast amount of space to exploit and will turn into who can outscore the other in an open match. Tottenham’s Kane has been in sensational form as he leads the charge for the Golden Boot award with five goals to his name in two games. Closely behind him is Belgium’s Lukaku, but he is expected to sit out of this final group game due to an ankle injury he picked up in the match with Tunisia. The England centre forward has been pivotal in keeping the country’s score tally ticking over and he will want to further his lead as the World Cup’s top goalscorer. With the way this tournament is going with awarding penalties and England’s dominance from set-pieces, it will be expected for the North London forward to bag another. Kane is 10/3 to be the match’s first goalscorer with William Hill, as well as being priced at 13/10 to get on the scoresheet at any point throughout the 90 minutes with Unibet. With Martinez coming out to the press and suggesting that Belgium’s usual first team starters are likely to be rested, England have a great chance of winning this game and topping the group - something they haven’t done since 2006. “We have 23 players who I believe any one of which could play. If that’s the case, they need to be ready to enjoy their football, so I don’t think I should be worried about the danger of losing momentum,” Martinez said. Southgate is linked to bring in a few fresh faces - such as Eric Dier into midfield - but the former player will want to do everything in his power to go and win this group and carry through that momentum into the round of 16. While it can be said that the winners of Group G have a harder run to the final than the runners-up, Southgate will not entertain any unsporting behaviour in order to finish second. To be the best, you have to beat the best, which is what England have to do against Belgium and are 17/10 to do so with Betfair. Manchester United playmaker Jesse Lingard scored one of England’s two goals this World Cup from open play with an absolute pearler against Panama. In both games, the Englishman has been a breath of fresh air for Southgate, who has seen the 25-year-old continually make runs and draw defenders out of position for other English players to exploit. Lingard has been instrumental in the Three Lions’s attacking prowess so far and should be trusted to guide England to another win against Belgium - even if others are rested. He is 14/5 to score at any point during the 90 minutes with Coral, and he will be feeling confident in doing so.